Adirondack Vacation Guide: Major Snow! Winter Carnival this Weekend! A Guide to the High Peaks Region of the Adirondacks authored from Saranac Lake and Lake Placid. Get the most out of your vacation with personal insights from a local - me. Major Snow! Winter Carnival this Weekend! We received a foot of the white stuff overnight, and the extended forecast is pointing to snow every day for the next 10 days! 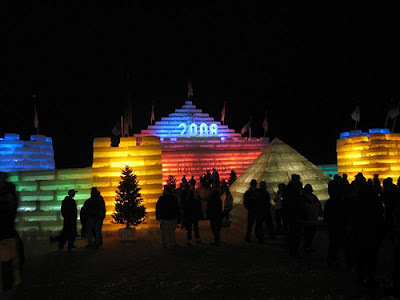 The Ice Palace is finished and lit in preparation for this weekend's culmination of the Saranac Lake Winter Carnival! Highlights include Saturday's Parade at 1pm, on Main St and Broadway, with floats and performances tied into this year's Horray for Hollywood theme as well as fireworks on Sunday night at 7. I am not certain of any clubs, but as far as restaurants go you will not be out of place anywhere you go. I often see single people dining at Le Patriarche and at L‘Échaudé. It would be a good idea to make a reservation at either of these places. wow this ice place is looking so awesome. man trust me your life is heaven . i cant step out of my home city because of my job. Please visit Panasonic’s “One Winter, Five Dreams” site at http://5dreams.panasonic.net/ and share the Olympic dreams of 5 aspiring athletes from around the world. I agree to you Ankur. Ice scating is one of those things that really is fun to do. Hope to learn ice scating. Thanks for the post. It's really an interesting one. Thumbs up! Wow what a post i am so impressed here can you more share here i will back to you soon as soon possible and also i have some information for you just click here Schengen Visa Application. I think you will inspire here. We run Harbor Hill Cottages in the Adirondack Mountains, cozy lake front homes and cottages on the edge of Lake Flower in Saranac Lake. Our blog focuses on activities in the Adirondacks' High Peaks Region (Saranac Lake / Lake Placid area).